All orders need to be paid in advance by bank or PayPal. Orders that are collected from our showroom can also be paid by PIN of in cash. All orders are shipped worldwide through TNT Express. In the Netherlands, you can also choose from PostNL. If you choose PayPal, your payment will be handled by Docdata. You will be charged a fee of 5% of the total costs. All payments need to be made within 7 working days. After your order, you will receive an email with our bank account details and your order number. Your order will be shipped after the complete amount has been transferred to our account. Keep in mind that it may take a few days. You can make an appointment to come pick up your order. In our showroom you can pay in cash or by PIN. Please let us know your complete address, so we can give a better estimate of the shipping costs. Each machine is tested before shipment and then carefully packaged. 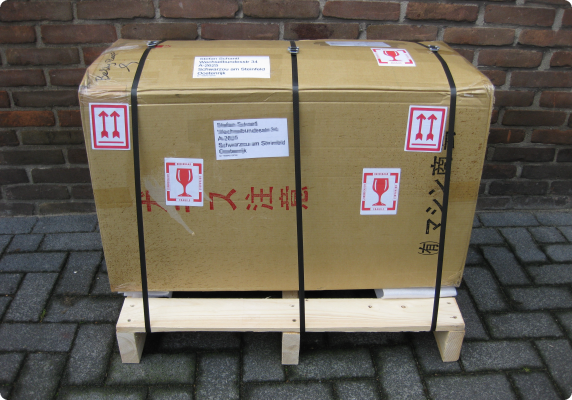 We ship pachinkos and pachislos on a small pallet, to ensure your order arrives safely and undamaged. Your machine is shipped ensured, so that in the unlikely event, that something happens, TNT Express will cover the costs. Smaller orders will be sent through PostNL package service and will cost around €8 for shipment throughout the Netherlands.